Paleochora (Palaiochora)(Παλαιοχώρα) is a picturesque coastal town in the southwestern part of Crete situated on a peninsula between two bays and standing on the shores of the Libyan Sea. Paleochora has a relaxed, village atmosphere about it, with a local population of around 2000 people. Within easy reach of the town and providing a backdrop to it are the hills and magnificent mountains characteristic of this part of Crete. Paleochora has two main beaches, one on the east and one on the west of its peninsula. Pachia Ammos on the west side is the main beach of Palaeochora, a long sandy popular beach which can be affected by the southern and westerly winds. The beach is ideal for swimming, water sports and is well equipped for sunbathing. When windy, Pachia Ammos beach is excellent for surfing. The western end of the beach is used by naturists. Paleochora's second beach has been a location for many concerts and events. It stands on the east of Paleochora. A beach of pebbles, it can be affected by the southern winds. It is good for swimming and sunbathing. There are additional beaches east and west of Paleochora. The coastline here is excellent for snorkeling and windsurfing. Paleochora was formerly known as Selino Kastelli because of the Venetian castle which was built here at the end of the 13th century by the Duke of Crete, Marinos Gradengos. Sited on the tip of the peninsula, it was built to control the two bays to the east and west. The castle has an interesting history, being renovated in 1325 and playing an active part in the revolution of Kallergis in 1332, when it was severely damaged, rebuilt by the Venetians in 1334, later, in 1539, it was to be ransacked by the pirate Barbarossa, to be restored again in 1595. The castle gave its name to this whole area of southwest Crete. It was fortified again during the Turkish period and today, renovated once more after being in total ruin in 1834, it is a popular tourist destination, attracting thousands of visitors every year. Below the castle there is a small harbour frequented by fishermen and a small island on the southwest side. There is a ferry connection to other south coast ports such as Sougia, Agia Roumeli, Chora Sfakia, Loutro, Elafonisi and Gavdos, Europe's most southerly point. The ancient Dorian city of Kalamydi which stood near the estuary of the Kakodikianos River, lies under the present town. The Venetians also built a new settlement here in the shadow of the castle which was known as Vourgos. In the Prefecture of Chania and Municipality of Pelekanos. 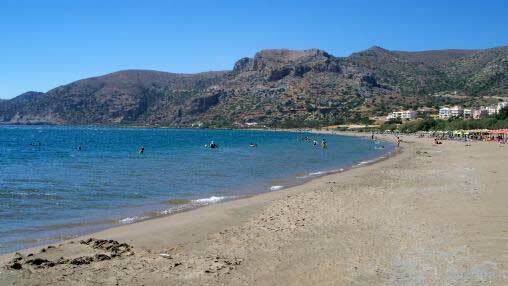 Palaeochora is easily accessible via good roads from the north or south of Crete. It is approximately 75 km from the city of Chania. There is a regular bus service from Chania and other local towns.